The Cane Creek Helm Air 29 fork blends a huge range of adjustability with top-quality execution to deliver a highly capable trail fork. The Cane Creek Helm Air 29 is an 8-way adjustable suspension fork optimized for 130mm to 160mm of travel. Born in the mountains of Western North Carolina, Helm is designed to conquer aggressive trail, enduro racing, and anything in between. By isolating each damping and air spring adjustment, the Helm aims to have the ability to be tuned for all types of terrain and riding styles and give the rider full control of their suspension set-up. Mtbr’s test model Cane Creek Helm Air 29 weighed 4.44 pounds (2010g). Price is $899 and it’s also available in 27.5 form. The left side of the fork houses the air cartridge. A nice aluminum cap protects the valve. When the first Cane Creek Helm hit the market it made a big splash. But it was only available in a 27.5 version. Now, as the line has expanded to include air and coil spring options and 27.5 and 29 models, I was eager to get my hands on a Cane Creek Helm Air 29 for review. Cane Creek’s reputation for suspension is well-earned thanks to its shock lineup. Despite stiff competition, the North Carolina-based component maker is churning out fantastic product. I’ve ridden Cane Creek’s Helm Air 29 with 140mm travel for the last couple months. This included a long weekend in Moab and plenty of time on Colorado’s rough and rocky Front Range. After a few rides and some help from Cane Creek to figure out my initial settings, the Helm Air quickly had me riding with confidence in a wide range of terrain. Both the positive and negative air chambers are inflated via the left side valve. Removing this cap exposes a shaft and piston assembly used to adjust air volume. The 8-way adjustable fork can be intimidating, but Cane Creek’s 38-page manual (found here) is very helpful, explaining how to make adjustments and how they’ll change the performance of the fork. Here’s a look at all the different aspects that makes the Cane Creek Helm Air 29 worthy of consideration. 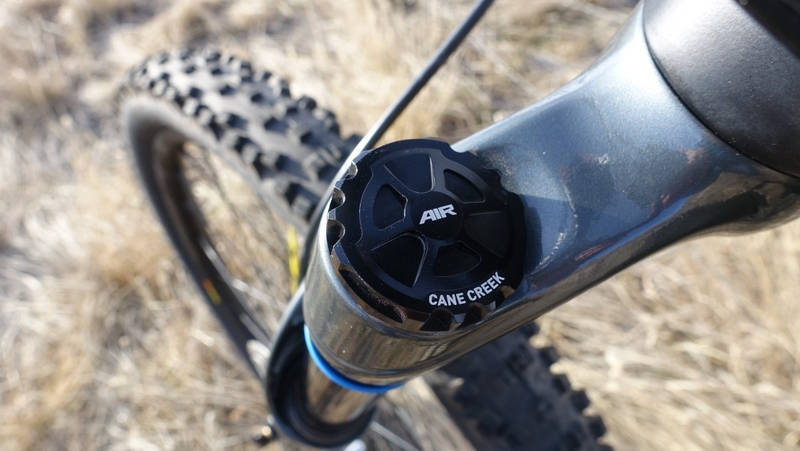 The Cane Creek Helm Air 29 features both positive and negative air chambers and pressures are independent. The negative pressure is set by inflating the positive chamber via a valve atop the left fork leg and then hitting an equalizing button on the bottom of the same leg. With the pressures equal, you then add or reduce pressure in the positive chamber. Under the left leg you’ll find the negative valve equalizer, protected while riding by a threaded-on aluminum cap. 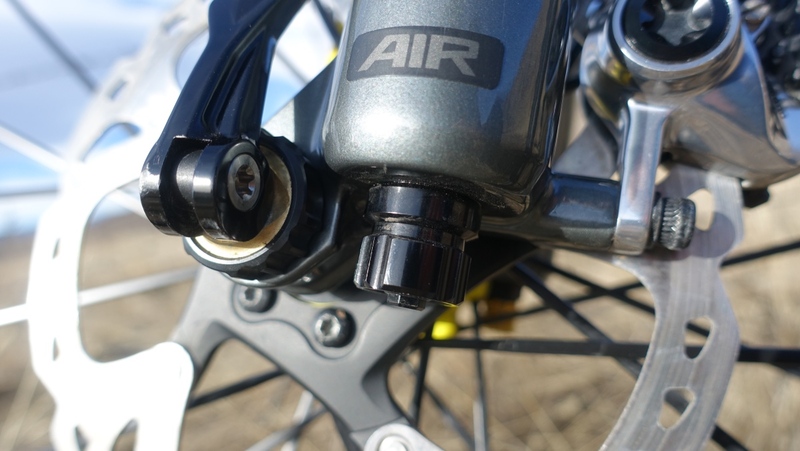 Air pressures can be run as low as 30psi and as high as 150psi and Cane Creek recommends that you start with half your weight (with riding gear) in psi as a starting point. I weigh 160 pounds with gear and ran the Helm Air on the softer side, closer to 75 psi. Cane Creek recommends 15 to 25 percent sag and this is how you want to find your air spring pressures. While I initially ran the fork at a positive pressure slightly lower than suggested and equal negative and positive pressures, Cane Creek then advised that I go back to a higher positive pressure and an even higher negative pressure. This helped keep the fork extra active at its top end, absorbing small bumps and helping the fork mesh with my light weight and intermediate trail skills. I liked this setting so much that even as I played with different pressures, I stuck with a slightly higher (2-3 psi) negative spring setting. Remove the black cap and you find negative chamber equalizing valve. Those who ride more aggressively, weighting the front tire more heavily, or riders who are heavier probably won’t need the negative springs help to get into the fork’s travel. But the ability to tune this so precisely is fantastic. It is highly adjustable and easy to tinker with settings. The Cane Creek Helm Air 29, like many of its competitors, has both high and low speed compression adjustment. There are 17 clicks of adjustment for low-speed compression and 10 clicks of high-speed compression. 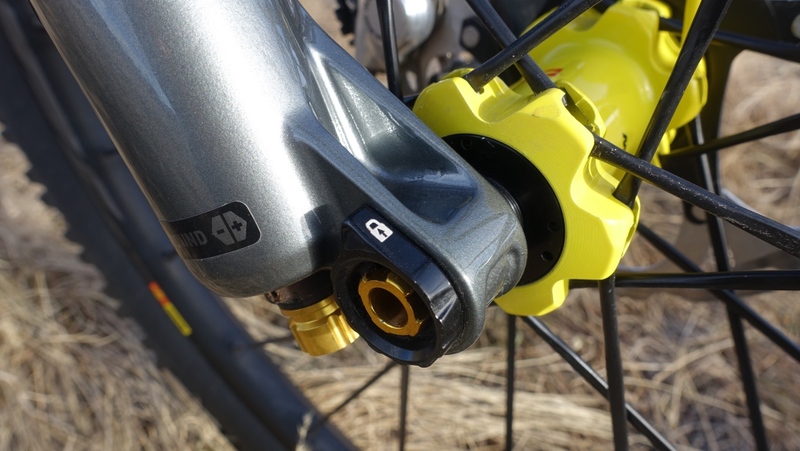 The compression damping and rebound is handled by the right side of the fork. The all-aluminum assembly controls low speed compression with the gold, inner knob, and high speed compression with the black outer knob. If you need a quick reminder, compression damping controls how easily a fork will compress when it encounters a load via an obstacle, trail undulation, or rider input. Low speed compression handles brake dive, pedal bob, and overall traction and stability. High speed compression deals with big impacts, square edges, and rough landings. Both the compression settings are adjusted on the top right leg of the fork. The outer knob controls high speed compression and the internal knob takes care of low speed. I found that once I dialed in the low speed compression, I rarely revisited it. I got the fork feeling the way I wanted it to, free from excessive bob and limiting brake drive, but still very active, and left it there. If you’re a more advanced rider or using the Helm on a slalom or dirt jump bike you may play with this more. But for my purposes, I wanted the fork supple and moving. 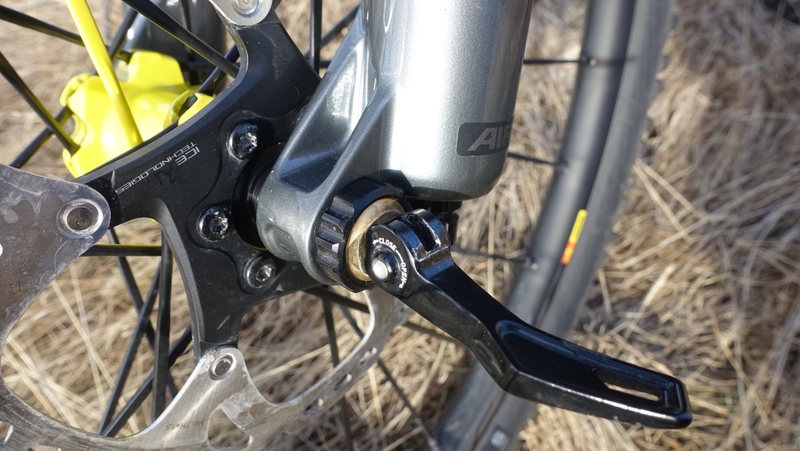 The D-Loc Axle has a tension adjustment ring on the lever side of the assembly. The lever rotates a self-lubrication brass piece to keep action buttery. To remove the wheel, you open the lever and then move to the right side of the fork to unlock the axle. High speed compression, on the other hand, is something we all adjust frequently, especially as the trail became smoother or rougher. 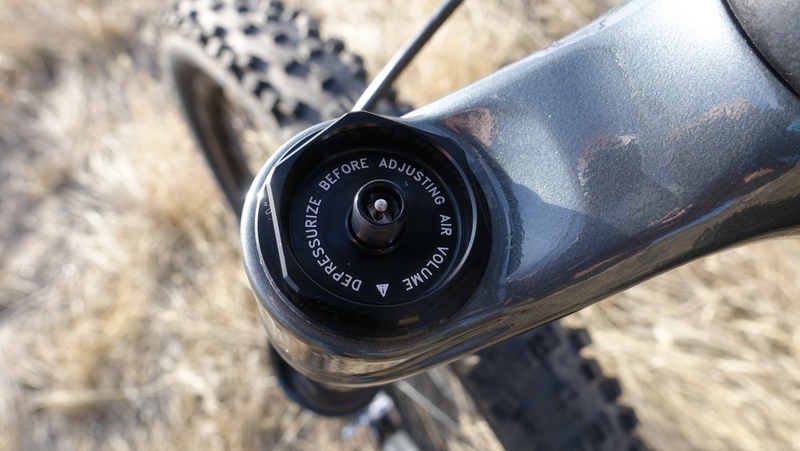 It’s a much broader adjustment and I liked the more finely tuned 10 click adjustment compared to the trio of settings offered on some other forks. I often want a little more compression damping than wide open, but not as much as the medium or pedal setting, especially in terrain that is constantly varying. XC racers look away now because the Helm does not have a lockout. The fork is meant to be active and remains so even with the compression knobs fully closed. The compression settings, while important, were the subtlest of the externally accessible controls. The difference between wide open and fully closed wasn’t a huge one. Yes the fork firmed up but it still exhibited great oil management, feeling controlled, when wide open and didn’t feel like a sloth when shut down. Perhaps a more hard-charging rider would notice it more than I did, but I would also argue that this is a good thing. It’s hard to get the compression settings wrong. They just kept on working despite my attempts to do my worst. 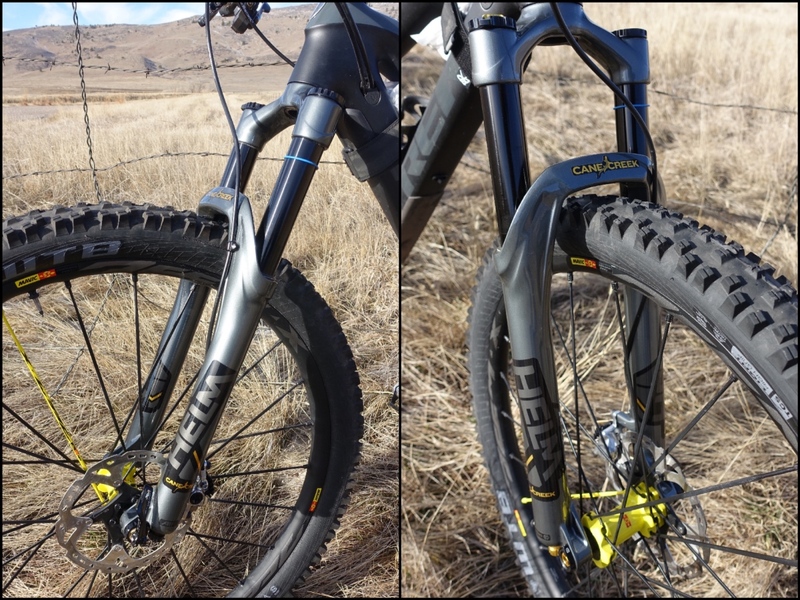 The Helm Air 29 easily accommodates a WTB 2.5 tire. Leaving no stone unturned, Cane Creek even made the brake line keeper out of aluminum. 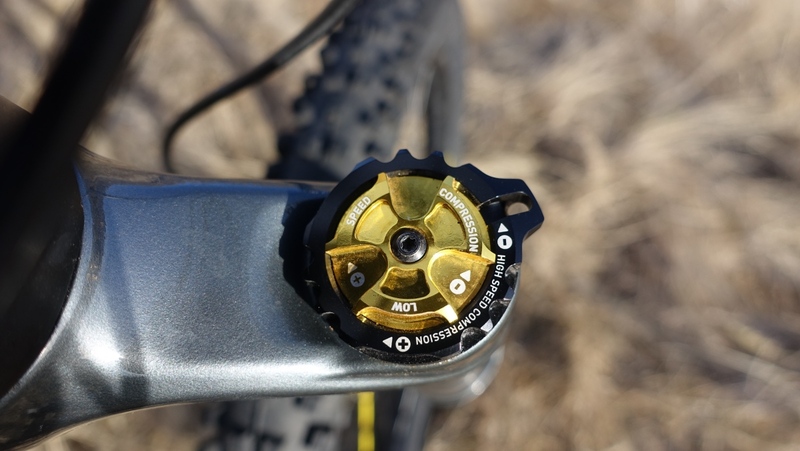 Rebound damping on the Cane Creek Helm Air 29 is adjusted via a knob on the bottom of the right fork leg. There are 10 clicks of low speed rebound adjustment that control how quickly the fork returns to its pre-sagged ride height. As a lighter rider, I ran a slightly higher rebound damping setting, slowing its return so that I didn’t feel like I was aboard a bucking bronco. If you have your sag set properly but find yourself blowing through the fork’s travel too quickly or not using the entire stroke, you’ll want to adjust the air volume. There are eight air volume settings. This is changed by adjusting a static piston assembly along an indexed rod on the air side of the fork. No tokens or volume spacers are used in the Helm. You’ll need a 30mm wrench and you’re set. Just be sure to release all of the pressure in the negative and positive chambers before diving in. Lowering the piston on the rod decreases volume and increases the ramp of the air spring, making the fork more progressive and harder to bottom out. 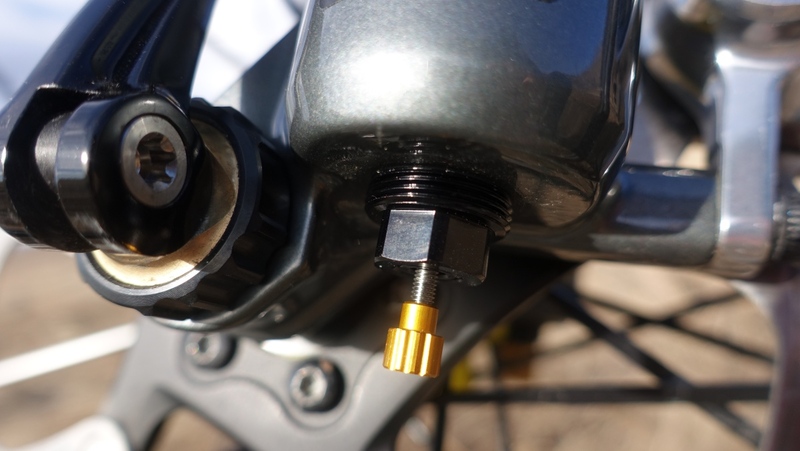 Internally, the travel of the Cane Creek Helm Air 29 can be adjusted in 10mm increments from 100-160mm of travel, but it is optimized for 130-160mm. Unlike other forks, you don’t need to buy different air shafts to change your travel. But it does require the disassembly of the lowers to change travel. With the right tools, it isn’t complicated. 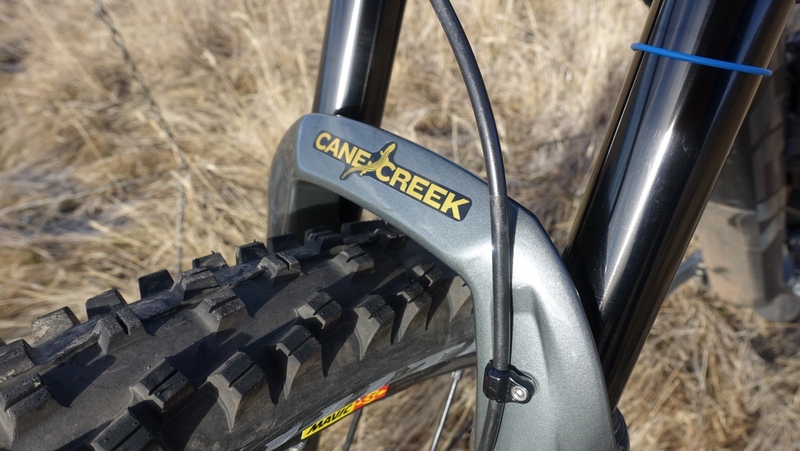 Cane Creek includes two travel reducers with every fork allowing a shop or the owner to decrease travel. Additional spacers can be purchased aftermarket. My review sample came preset at 140mm and I left it there for the duration of the test. Unthread the orange locking screw and depress the valve to equalize pressure in the positive and negative chambers. Do this until you reach the desired pressure in the negative chamber. Close it up and then adjust the positive chamber pressure. 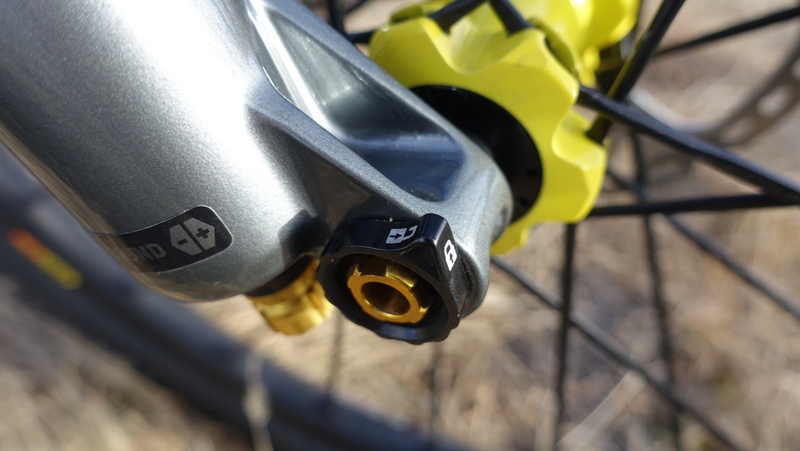 Cane Creek’s D-Loc Axle is a different, faster take on a thru axle. Instead of threading into the fork end, it uses a floating ring that is adjusted to set tension on the lever side and an open/close retention ring on the drive side of the fork. Open the lever on the non-drive side, then flip a retaining ring on the opposite side to release the axle. It’s quick and easy to use. With 35mm stanchions and similar wheel and travel options to Fox’s 34 and 36 lines and the RockShox Pike, the Cane Creek Helm Air is certainly a trail fork. Weight is similar to a Fox 36 Factory, but nearly half a pound heavier than a Fox 34 Factory. On trails with frequent ledges and squared-edge step-ups and on fast, descents the Cane Creek Helm Air 29 shined. It soaked up the small stuff without sacrificing its ability to take on bigger obstacles. The chassis is stiff, helped by 35mm stanchions, good castings, and the D-Loc thru axle. This allows the excellent internals to do their job. I love that the fork doesn’t require you to keep track of tokens or spacers to adjust air volume. I also love the independent positive and negative air chambers. Finding a series of settings that works for you isn’t difficult even with the wide range of adjustability. Now in the open position, the axle is freed. This quick, two-step process is faster than threading in a traditional thru axle and Cane Creek claims that it also increases chassis stiffness. While I haven’t been on Fox’s 2018 34 Float Factory fork with the EVOL chamber, my personal fork is a Fox Float Factory 34. I’ve also spent time on a RockShox Pike. Compared to those two excellent options, I still found myself preferring the Cane Creek Helm Air 29. Maybe that’s just because it’s something new and different, but I suspect it has more to do with the amount of control I have over the fork with even simple tools. To add to the appeal, Cane Creek recently reduced dropped the price to $899. That puts it right in the mix with Fox and RockShox depending on options. 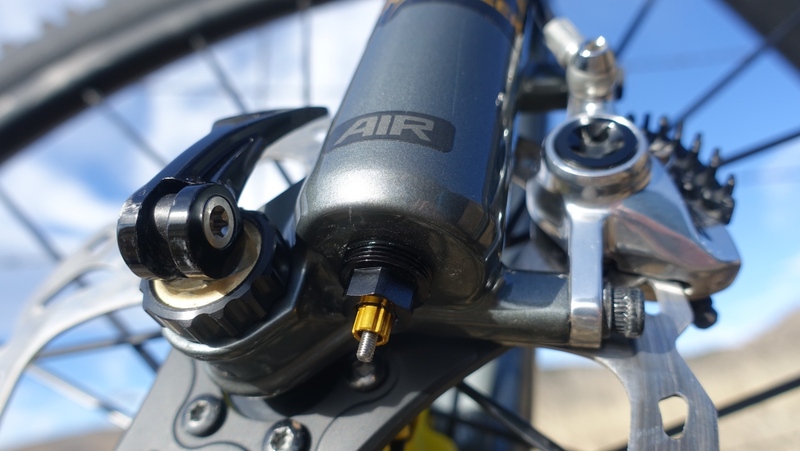 Cane Creek’s Helm Air 29 fork is one for the suspension nerds. It’s highly adjustable and rewards the rider who takes the time to experiment with settings. For a fork with this much adjustability, that is this well engineered, I’d say it’s money well spent. This shows the right side tab in the locked position. Also seen is the gold aluminum knob for the low speed compression rebound adjustment.